Top Winter Pond Tips If you choose to run your pump during the winter, and it's powering a waterfall, it's important to monitor for ice dams. These are ice accumulations that can occur at the base of your waterfall during freezing conditions. Predators: During the winter months, your pond is mostly exposed. With no plant coverage, it can be susceptible to predators, mainly blue herons. There are a few tactics to employ for their protection. Your standard decoy is always an option. Herons are territorial, so another in the area will generally deter one from entering the area of your pond. These will need to be repositioned every day as herons are smart birds and will figure out they are not real if in the same position for too long. Freeze Over: To maintain an opening on the surface of the pond, a floating deicer is probably the easiest, most cost effective and safe way to winterize your pond. Their primary purpose is to prevent the complete surface of your pond from freezing. Throughout the year, the pond bottom will accumulate debris- leaves, plant matter, fish waste, etc. This debris will break down and decay. During this process the gases released from the decaying debris are toxic to fish if there is no release. A deicer allows for the escape and release of these gases, proper return of oxygen and ultimately ensures the safety of your fish during the winter months. All tips on this page should be scrutinized for their application to your individual needs. 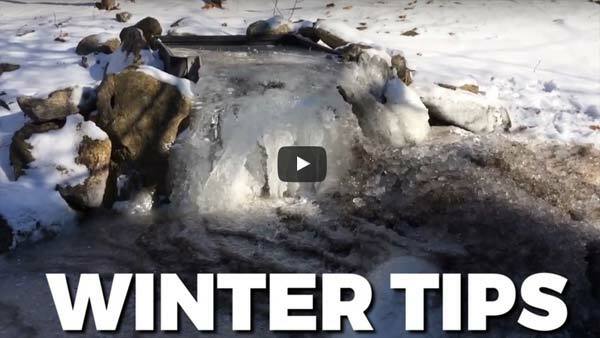 Everything you need to know for winterizing your pond.